It’s bizarre that I like this soup. But I don’t just like it I crave it. You see, I’m not a fan of soups with a consistent texture, which split pea soup normally is. Take, for instance, butternut squash soup. The first few spoonfuls are delicious, but by the fourth or fifth I just get bored. 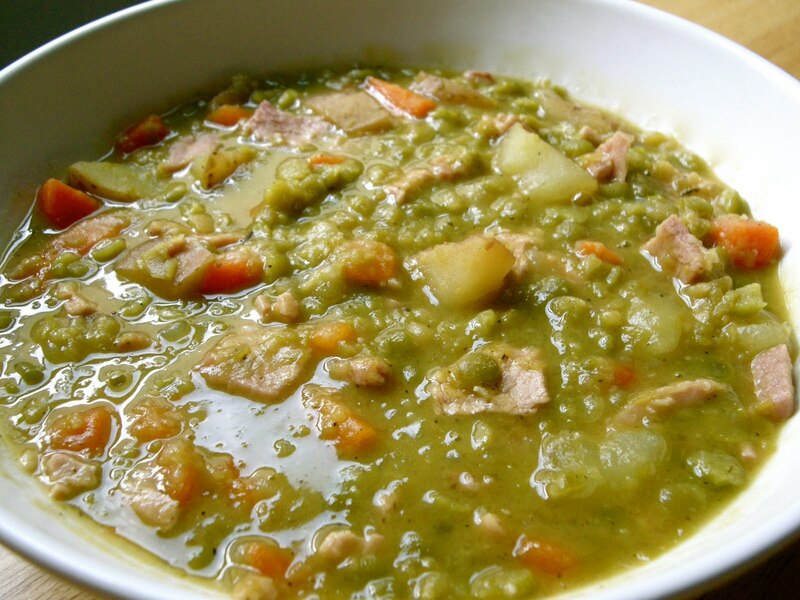 Not so with this split pea recipe—there’s so much going on in every single bite. Let’s start with the unique preparation of adding the split peas in two batches. The first batch breaks down to form the creamy base. Plus, that base combines with the red boiling potatoes to up the creamy factor without a drop of anything fatty. At the same time, the potatoes maintain some of their original texture so every spoonful or two you bite into a soft chunk of pink-skinned spud. The second addition of split peas, which cooks for less time than the first, gives the soup another layer of texture. I can’t really describe it. Since they don’t completely break down like the first batch, let’s just say they give you a reason to use your teeth. Then you’ve got the carrots. Oh, the carrots, the unspoken heroes in the pot. Not only are they another way to intrigue your palate and diversify the nutrients, they’re also a treat for your eyes since the pops of orange break up the predominant green hue. Although this soup needed no help in the protein department, I added small pieces of boneless ham steak. Because, well, if I was going the comfort food route (perfect for this cold, dreary day) I was going to go all the way. In a big pot on medium heat, sauté the onions and garlic with the olive oil, oregano, salt, and pepper until the onions are translucent, 5 to 10 minutes. Add the carrots, potatoes, about 1 ½ cups of split peas, chicken stock, and water. Bring to a boil, then simmer uncovered for 40 minutes. Skim off the foam while cooking. Add the remaining split peas and continue to simmer for another 40 minutes. Stir frequently to keep the solids from burning on the bottom. Optional: When soup is almost finished, spray a pan with cooking spray and heat on medium heat. Add ham steak and heat until it browns (about 5 to 10 minutes). Flip the ham and brown the other side. Remove ham to a cutting board and cut into tiny bite-sized pieces. Add the pieces to the soup and stir to combine. Note: The soup will thicken considerably when you store it in the fridge. When reheating leftovers, add some water or chicken stock to thin it out a little. This entry was posted in Soup on October 19, 2011 by Paige Greenfield.